When it comes to beauty regimes it’s not always the easiest to find the time to fit everything in. 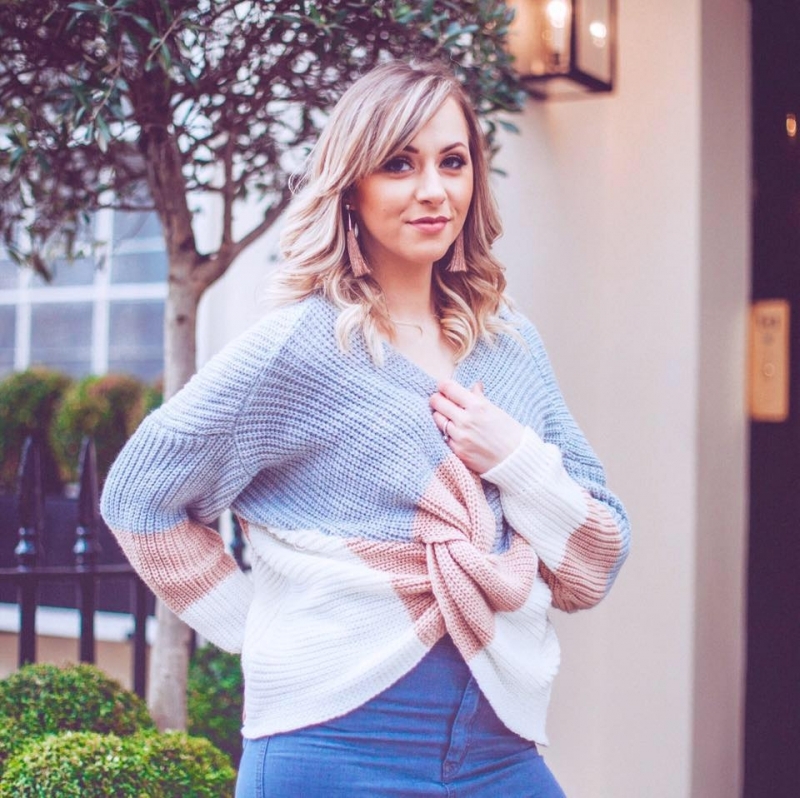 From multi-step skincare regimes in the morning and evening, as well as face masks and specialist treatments – there’s barely enough time to cover the skincare bases and that’s without the make up. Life can be BUSY. Really busy. And it’s hard to make the time to take care of the skin as well as finding and applying the right make up products. 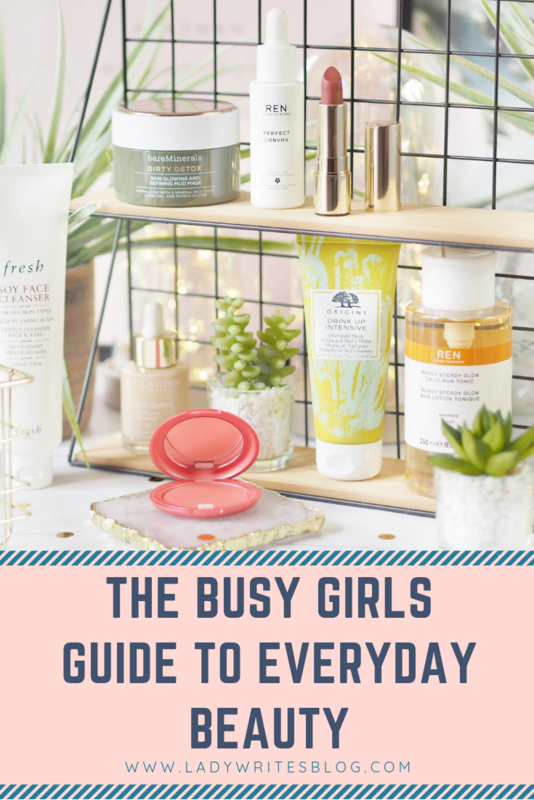 Sometimes we skrimp on the skincare or forgo the make up due to lack of time, but with these key products there’s a way to cover all your bases on those really busy days. 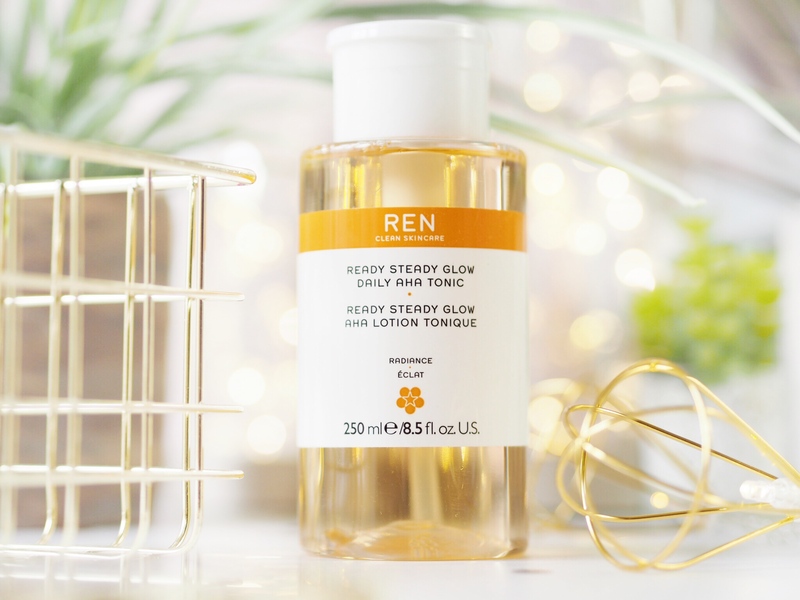 After cleansing the face with your normal cleanser, spend thirty second with the REN Clean Skincare Ready Steady Glow Daily Tonic. This everyday toner is perfect for use on all skin types and gently exfoliates with it’s lactic acid to buff away dirt and dead skin cells, and then it brightens the skin underneath. It evens the tone and makes things just look overall brighter across the face. It’s one of those products you need in your daily regime and you’ll notice a difference to the skin very quickly with regular use. Cleaning that top layer of skin is essential to maintaining healthy everyday skin because it unclogs the pores and promotes a clearer balance across the face. 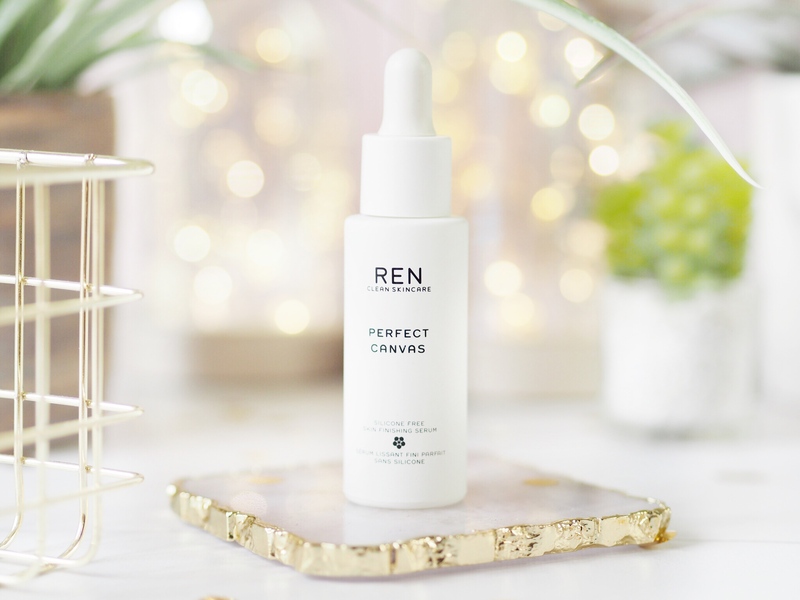 Starting with the daily make up application, the REN Clean Skincare Perfect Canvas is a great place to begin. This is a pretty special primer – and I’ve tried a lot, so saying that is a huge statement. 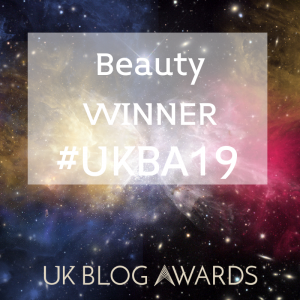 This does pretty much everything you would want a primer to do – it fills in pores, smooths the surface of the skin as well as also filling in fine lines and wrinkles. It has the perfect matte finish that creates a perfect base for make up. Not only does it work well for the make up side of things but it also contains probiotics and a type of product that converts to hyaluronic acid when on the skin. So it has long term nourishing effects as well. It’s pretty much a wonder product for everyday beauty regimes. 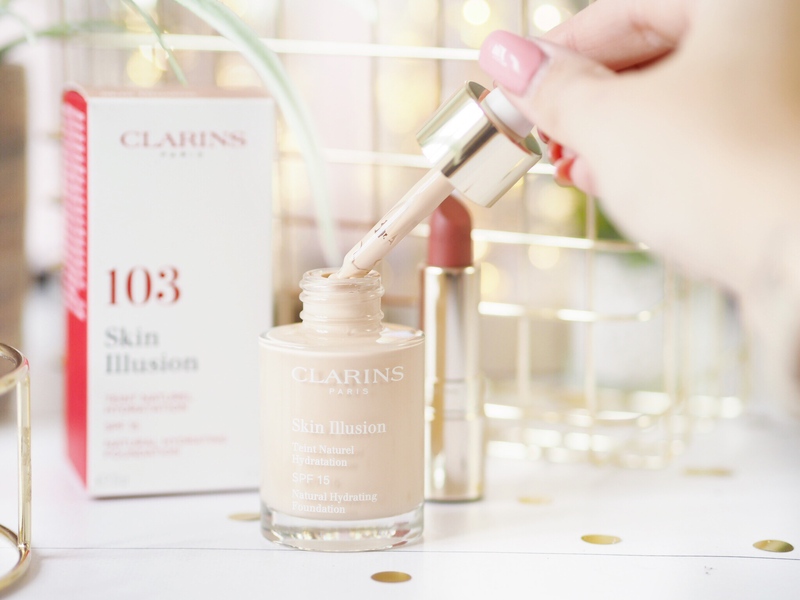 The newly relaunched Skin Illusion foundation from Clarins is the perfect everyday foundation for busy girls. It helps to give coverage without masking the natural beauty underneath and it’s got a sheer and hydrating finish that can be built up to medium level of coverage with several layers. Otherwise just a few drops will create a barely-there but beautiful coverage. 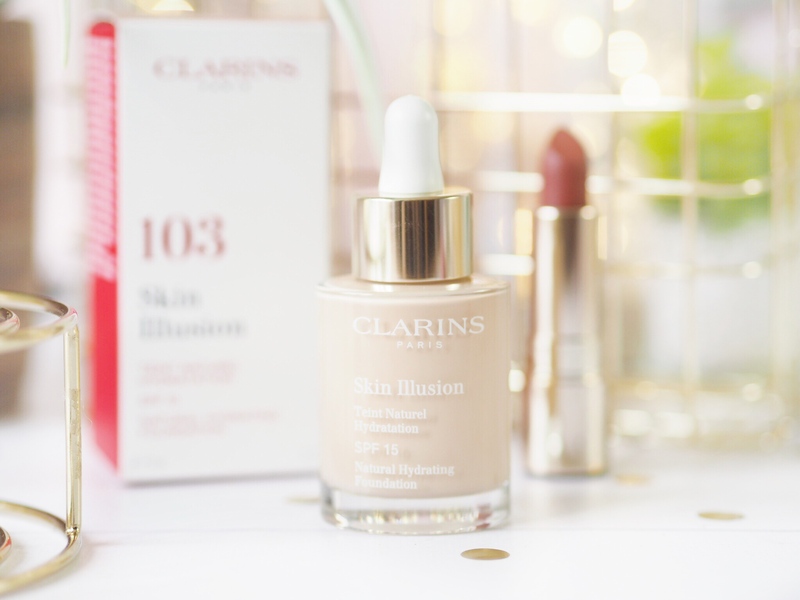 So it’s perfect for those of us who never have a lot of time but want a natural looking foundation that emphasises natural glow and radiance. Available in 22 shades, it’s got non-greasy oils to boost that glow we all want, even when we don’t have a lot of time to achieve it. A good lipstick will see you through every eventuality that the day has. And a quick and easy one to always have in your bag is the Clarins Joli Rouge lipsticks. These pigmented lipsticks come in multiple finishes – with the traditional one being a nice satin finish that sits in between glossy and matte. Coating the lips in a rich colour, it’s hydrating and vibrant and there’s up to six hours of life in each application. Even if you don’t have much time for a full-face of make up, always have a good lipstick to hand as it can transform the face. Next up for quick everyday beauty is the Stila Convertible Color. 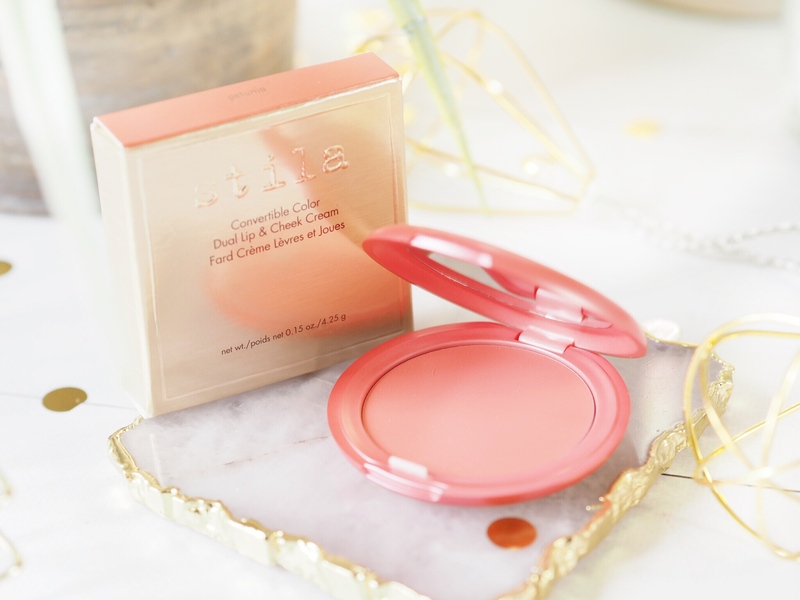 This gorgeous little compact contains a multi-purpose lip and cheek color that can be used to instantly perk up the complexion. 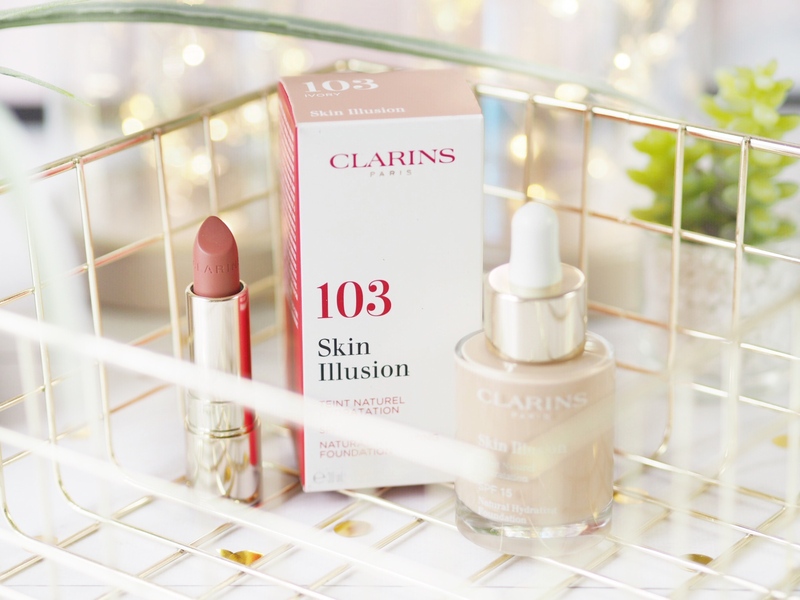 Applied best with a sponge to the apples of the cheeks, then with the fingers or a brush to the lips, this wonder-product sells out fast, so stock up on your favourite shade! There’s six to pick from and the universal pink shades mean you’ll find one for all skin tones. A product like this is perfect for quick-beauty days. And gives a nice subtle glow to the cheeks especially. 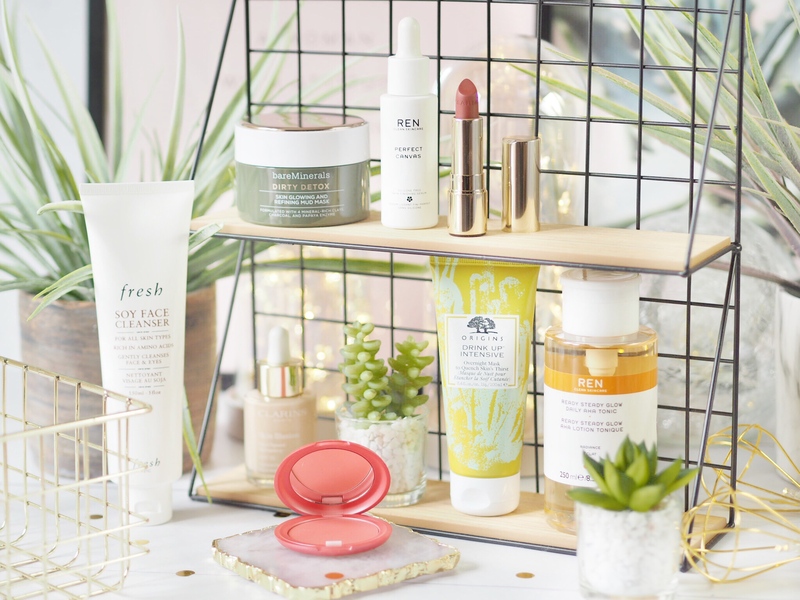 Starting your intense facial skincare regime during busy times is hard, and often we leave this section behind in favor of having more time for other things. But we should never neglect our skin and the first step in indulging is some face masks to maximise the appearance. I recommend using the Bare Minerals Dirty Detox Mask twice a week to begin with. So it won’t need using everyday – which means you don’t need much time to see maximum benefits. This clay based face mask does wonders for the skin with it’s intensely detoxifying properties. It cleans and clears the skin while also delivering minerals within the clay to create a glowy and radiant looking skin surface that looks so healthy. Purifying and detoxifying, this mask is essential TLC for busy girls and their everyday skin. 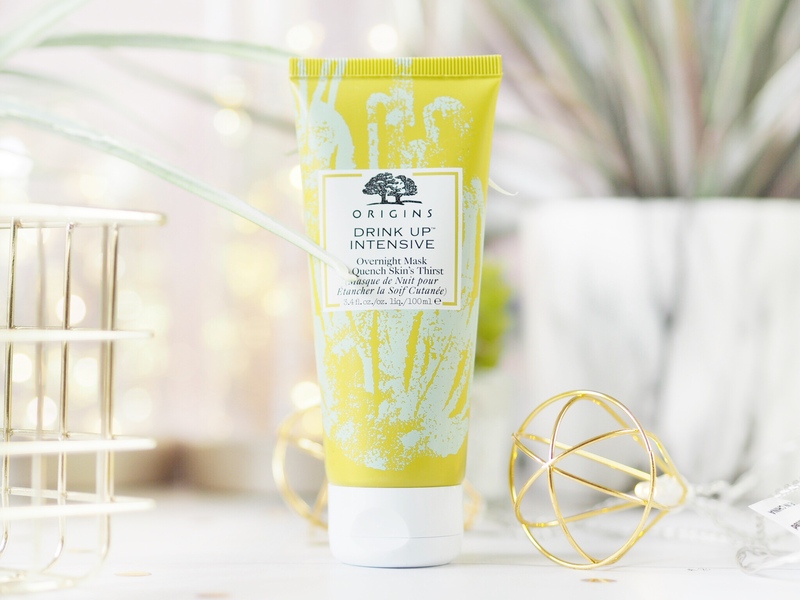 Another twice a week mask to use on different days is the Origins Overnight Mask To Quench Skin’s Thirst. I am a huge fan of this mask and I love the notion of overnight products because they are designed to work in conjunction with the skins natural repairing and restoring process that occurs overnight. It’s an ideal time to invest in good skincare treatments and this intensely hydrating mask is perfect for pretty much all skin types. The mask helps to repair the skins barrier and therefore help to naturally encourage hydration levels to be retained. Which should help prevent premature ageing and things like that. It nourishes skin instantly and works to create long term benefits so using two minutes to apply this before bed is a great way to look after your skin with minimal effort. And there we have it – only 12 -25 minutes per day – THE WHOLE DAY! Is all it takes to implement a total beauty regime. Covering everyday essentials these can be your basics from which you build upon when you have more time. Treat these ones as the non-negotiable, the ones you don’t ever forget and anything else would be a bonus. These few tiny steps throughout the day don’t take long and will create a healthy skin and natural looking make up day so that you’re covered even when you’re super busy. That Stila lip and cheek cream is gorgeous! 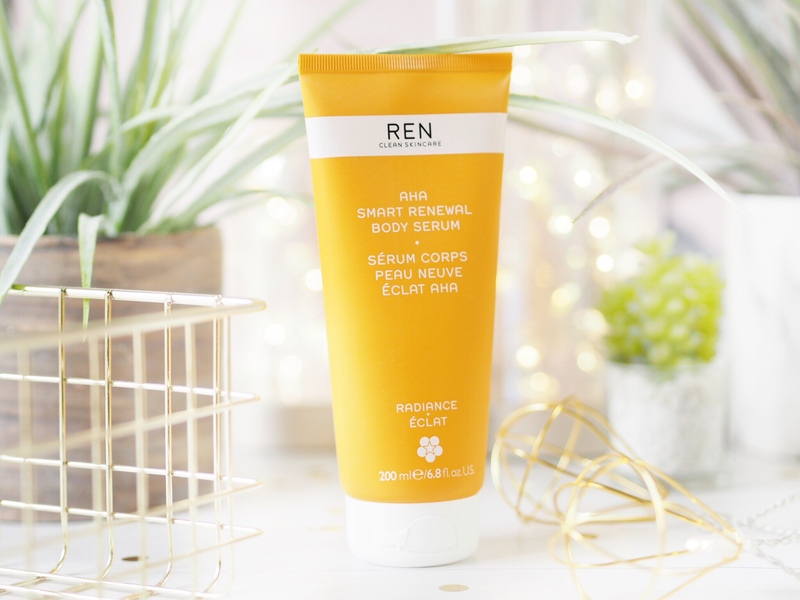 The REN Primer and Tonic are fantastic! I am keen to try the new Skin Illusion Foundation as I loved the old. My skincare routine doesn’t take very long at all which is a bonus. I like doing it but I always want to be getting on with other stuff! All of the Ren products sound amazing, I need to try some myself. 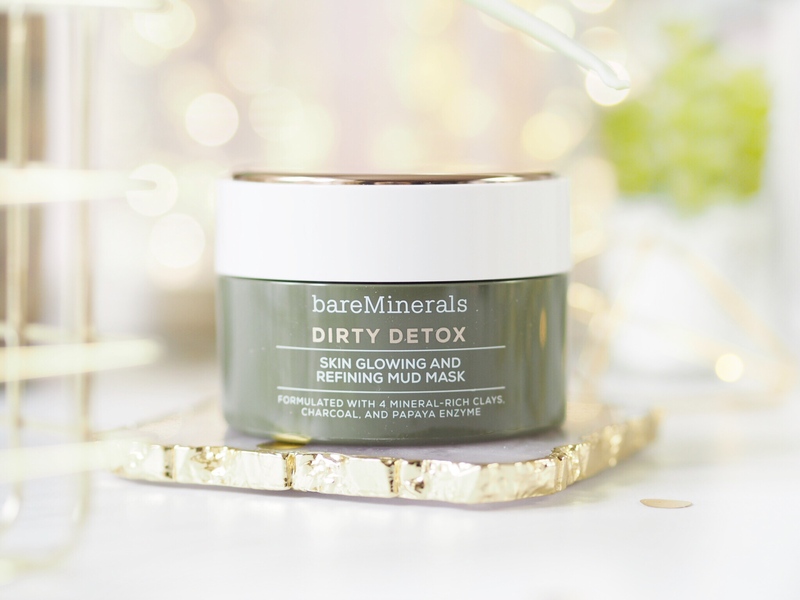 The bare minerals dirty detox is a holy grail of mine! I’ve not tried any of these, I must get online and treat myself!